The Canadian hotel real estate market continued its positive drumbeat in 2015 with transaction volume reaching $2.46 billion, a 70 per cent year-over-year increase with 147 transactions reported. It was a year of record-setting volumes; the highest since 2007 and the third highest in history. A number of macro-economic events impacted the markets in 2015 – most notably commodity price declines and a drastically lower Canadian dollar. While some parts of the country were in turmoil, particularly energy-dependent markets, a large majority thrived seeing strong operating performance and investment activity. Heightened interest in the overall transaction market persisted, facilitated by a healthy debt market and a wide variety of well-capitalized buyer groups, including increased interest by cross-border purchasers. 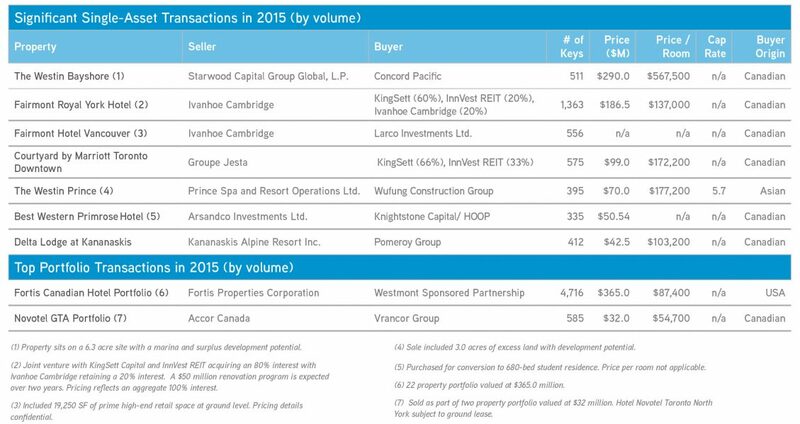 In the recently released 2016 Canadian Hotel Investment Report, Colliers collected views from some of Canada’s largest hotel real estate participants. Generally speaking industry participants remain bullish on the market (with cautious optimism being placed in energy dependent markets), particularly given the broad cross-section of capital seeking hospitality assets in the market today, as well as Canada ranking highly as an attractive country for drawing international investment. Perhaps the most significant motive for deals to transpire in 2016: cash returns remain attractive given where cap rates and interest rates lie. Other viewpoints rose among hotel participants as well. For example, there continues to be good investment opportunities with a healthy mix of investor types in the current landscape that attract a variety of different product given various investment and exit perspectives. Institutional capital is largely focused on urban, full-service assets in core markets for longer-term holds and would place money in key assets if the opportunities were right. While private investors and hotel investment companies are also targeting Canada’s top markets, they are also less risk-averse to investing in smaller markets subject to proper due diligence on timing the market, picking the right product positioning and taking advantage of the current cost of capital. The premise that portfolio diversity matters more than ever has evolved into a golden rule for both small and larger investors in order to spread risk and exposure over the long-run. The majority of participants cited the benefits of having properties in multiple geographic regions to help offset turmoil that can arise in markets or regions dominated by only a few core industries. Investing in larger urban markets have obvious advantages of reduced volatility given more diversified economies, but on the flipside several smaller markets have seen such tremendous gains in the current cycle that these can often override losses so long as the investor can weather the storm. Several groups cited that diversity into other real estate asset classes also significantly helps their overall portfolio returns, particularly when the economy turns and the hotel market often sees larger declines than other asset types such as office and multi-residential. Currency trends are going to fare well for the market from both an operational as well as investment perspective. Canada is one of the world’s top destinations and the country continues to increase its awareness on a global scale for attracting the individual traveler as well as group and tour business. Significant benefits are accruing from the efforts of Destination Canada, the government agency responsible for marketing Canadian travel, and with the low dollar continued positive results in key markets across the country are anticipated. Cross-border investors are also increasingly looking at acquisition opportunities, although their investment criteria are largely focused on major-market urban projects, which there is limited availability and are met with increased competition from well-capitalized domestic capital sources. In hotel real estate, as everywhere else, industry disruptors are top of mind. Fresh off the previous decade-long battle with online travel agencies (OTAs), new innovations such as Airbnb are rapidly transforming the way travelers book their accommodations. While these innovations are providing some benefit to the consumer, it has yet to be determined what impact these alternative distribution channels will have on traditional hotel performance. Owners of assets in secondary and tertiary markets for the most part do not see this as a major threat. The fundamental challenge is that this channel is not properly monitored and regulated. Continued operational improvements are on the horizon from a top-line perspective, but there is more room to improve the bottom line. The recent rebound in high-torque markets such as Vancouver and Toronto as well as Alberta mountain resorts is a great success story from a top-line perspective. Optimism is abound for further improvements in these key markets given economic forecasts as well as currency benefits in the short to medium term. Another key component to top-line growth is owners investing significant capital into older product, thereby allowing for healthy rate gains, as well as the reduction in supply as conversions of hotels to alternative use continues. The increase in top-line (particularly with rate growth) translates to increased bottom-line flow-through and profitability. However, many participants believe there is still more room to increase rates and it is particularly crucial given increased operating costs that can outpace revenue growth. Owners are continuously evaluating their cost structure including key items such as labour, property taxes and other operating expenses in order to improve profitability. Investors in today’s market are methodically making moves to solidify their portfolios, to take advantage of upside, and mitigate threats. While there are serious concerns with energy-linked markets at the present time, Canadian hotel investors are generally well-capitalized, and for the most part, geographically diversified. Current sentiment may be that of cautious optimism, but positive industry characteristics are overshadowing near-term concerns with major hotel real estate owners optimistic about long-term opportunities and returns. Foreign investors acquired 27 Canadian hotels in 2015 representing $515 million (21 per cent of volume). The largest and most notable acquisitions include the 22 property Fortis Canadian Hotel Portfolio, which was acquired by a Westmont sponsored partnership backed by American capital, as well as The Westin Prince Toronto, which sold for $70 million to an investment group based out of Mainland China. Continued Momentum in Transaction Activity: Following several high-water mark years, overall transaction volume in 2016 should be in-line with average volume seen in the current cycle, still indicative of healthy market fundamentals. Foreign Groups to Aggressively Bid on Hospitality Assets: Depending on product availability, Canada will continue to pique the interest of foreign investors attracted to the country’s stability, with the exchange rate being a significant advantage in boosting purchasing power for many global currencies. Dynamic Debt Markets: There is a growing availability of debt capital across the board, fueled in part by new financing entrants eager to place funds in the hospitality asset class. In addition to growth in providers, record low bond yields will continue to support the transaction environment. All Eyes on Energy Dependent Markets: Weak oil, metal and other commodity prices are widely anticipated to continue throughout 2016 and into 2017. An increase in distress driven sales may materialize in certain markets, particularly secondary and tertiary markets that are heavily reliant on commodity extraction. Continuation of Industry Consolidation: Big headline mergers and industry consolidation news was plentiful in 2015 and will continue in 2016. With large consolidations of parent companies, this will no doubt lead to increased competition and a run to secure market share. However, the impact will predominately be on a more global scale versus domestically. Continued Improvement in Operating Performance: Domestic tourism is poised for continued strong growth and generally has a positive impact on operating performance. Major markets, border cities, and other seasonal and resort markets should greatly benefit from currency trends. Airbnb Impacts Major Market Lodging Demand: The popularity of Airbnb and other hotel-alternative services could begin to impact lodging demand in major markets globally. The conversation on these services as a threat to the traditional lodging industry will rise. Fraser Macdonald is a research analyst with Colliers International Hotels. The 2016 Canadian Hotel Investment Report can be downloaded at www.colliershotels.com.